The jatt, along with his gandaasa and daru di bottle, moved out from the khait, went straight to the mall and swore his loyalty to the American brand Tommy Hilfiger. And then, the result was there for everyone to see — Punjabi songs that have used the word Tommy have actually exceeded the number of stores we have in Punjab and Chandigarh put together! As many as 86 Punjabi songs find a generous mention of the brand Tommy ,followed by Gucci and Armaani. Whether it is Sharry Mann talking Tommy dian shirtain ainak Armani in his famous song Yaar Anmulle or Jassi Gill ‘s mention of Tommy brand in his song or turbantor Ammy Virk telling rakho Tommy shommy pa key…Tommy indeed has caught the jatt's fancy! The fascination and fixation for this word doesn't seem to be fading with many new and old singers still placing the brand in their songs. For the singers, the brand can be mixed in any song and is also a word that youngsters can easily relate to. Now had Tommy Hilfiger any idea about the number of brand ambassadors he had in the region, he would probably gift them one of the brand's merchandise! When Alfaaz, lyricist, singer and actor decided to use a popular brand name in his song, he didn't realise he was making this as trend. "I have used Gap, Guess and Tommy in my songs; I would often observe youngsters making such a hue and cry about the brands. That is why the brands found a place in my songs since the youngsters can relate with the track." His recent song, sung by Amrinder Gill, uses Tommy lavishly. "And sure it has clicked," he says. If Tommy is ruling the roost, other brands like Ford,Gucci, Armani and Café Coffee Day also finds a mention here and there. Nevertheless, there is nothing that catches fancy than Tommy! Punjabi singer Ranjit Bawa with his track Guess Gap Gucci ya hovey Tommy, tu saari sirey tey brand bilo paundi shares the reason for using Tommy in songs, "When I was studying, this was the only brand that my friends or youngsters my age knew about. Also, we could get imitations of Tommy in Rs 500. That is why it is the most favoured brand in our songs." Jassi Gill, another Punjabi singer, in his super-hit album Lancer replaced 'Pepe' with Tommy. "In Punjab, this is a popular brand among youngsters. They wouldn't know about the others like Ck or Nina Ricci, but they definitely know about Tommy Hilfiger. That explains why the word is used in songs," says the singer. Punjabi songs generally talk about a particular trend or phase. Ammy Virk, whose recent track Bullet Vs Chamak Chalo uses the brand Tommy, also shares the same view, "This is a brand that everybody in Punjab knows about." As for the popular singer Sharry Mann, who has always hit on the right songs that every youngster can relate to, finds this as a brand that is common and slightly cheap. Now, Tommy should certainly be proud of this! 2 Hype, a lounge come restaurant, has a lot on the platter for food lovers. With 32 starters and 25 dishes in the main course, it sure has a variety to offer. Bhupinder Singh, owner of the eating joint says, "We have it all under one roof and people who love food will surely enjoy our preparation." The buffet is elaborate. You can spot a dal makhni, a butter chicken among other Punjabi dishes, a few from the Chinese cuisine, a salad counter, dessert section…so much to indulge in and so much to resist! Especially when dal makhni and butter chicken is something you live to eat, the 'resisting' part gets more difficult. But Gippy Grewal is not giving in to any temptation, not till he has achieved what he is working really hard for these days. "I want to make six pack abs. It's a bargain I have made with the food I love," says a fitter, leaner Gippy, who launched 2Hype, a restaurant in Sector 32, on Monday. He has already flown in a dietician from Mumbai, who is with him 24X7, monitoring his diet and its nutritional value. "I am strictly on the protein diet. All I eat throughout the day is egg, fish, chicken, minus the dollops of butter," he adds. The plan of action also includes strenuous kick-boxing sessions in Canada. "I am almost done with the shooting of Subash Ghai's production Double the Trouble. I am soon flying to Canada for a tour, but on the agenda besides work is lots of kick-boxing." All this in a bid to make a complete action film, which adheres to the standards of Bollywood action movies! "Something that doesn't use comedy to keep the story of the film going or uses punches as fillers for dialogues — it won't be the routine Punjabi cinema." Beaming post the success of Jatt James Bond, which has been well received by critics as well, Gippy, each time, wants to try something new. "Double The Trouble will be hilarious and then we have Dharmendra in it. I am sure that the film will set new standards of comedy as well," he signs off. Now this film is a clear break from what Pollywood had been churning lately. Story of Arsh and Deep, duet singers, Arsho looks like story of love, pain, deceit, intrigue and more. Actor-singer Dakksh Ajit Singh, who turns producer with Arsho, has written the dialogues as well as the songs and also sung them. He also plays the male lead. The trailer, launched in Chandigarh on Monday, did not go down well with those present though, as the lead actress has been shown drinking openly in front of her father (on screen). "But this is what singers or stars do in real life, be it Mumbai or Punjab," defends Dakksh. Mannat Singh, who plays Arsho in the film, jumps in to pacify the state of affairs, "I drank only apple juice for the scenes." The film, about duet singers, brings out the struggle that artistes have to go through. Dakksh and Mannat, actors as well as singers, are not only reel but also a real couple. "I have the faith if an actress could do justice to Arsho in Punjab, it's only her." Mannat enjoyed her journey as Arsho, "She is all that women dream to be, but seldom dare. She is bold and lives life on her terms," says this theatre artist from Amritsar, who does not believe in planning. "God is the ultimate planner," says Mannat, happy doing the show Nadaan Parinde and doing films side-by-side. As for Dakksh, making a movie is a passion. "People make films to earn money; I earn to make films." He already has a plan set for his next film. He has plans to release Arsho in Delhi, Mumbai, Rajasthan, Himachal and J&K as also overseas. "I bet whosoever watches the film will vouch for it being 'different'," says Dakksh who admires Mannat for the actress she is and even more as a person. "Whenever I am caught in a situation, it's her who guides me out of it." Directed by Shapinder Pal Singh, Arsho releases on June 13. 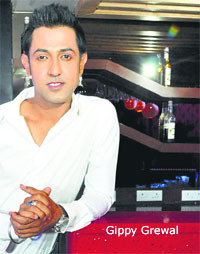 Popular TV actor Shakti Anand debuts in Pollywood with Arsho. He too plays a singer who is loud, larger-than-life with negative shade. "I fell in love with the script and wanted to be part of it from the word go," says Shakti, who apart from show Maharana Pratap, is doing another Punjabi movie as well as one is Marathi. "We definitely need good content in Punjabi cinema; there is potential and if all goes well we can make Punjabi films that can bag national awards and be sent to the Oscars." His parents being from Amritsar, Shakti can deliver written dialogues in Punjabi and is hoping to speak spontaneously soon. And, it's food that he enjoys most whenever shooting in this region. "Born and brought up in Delhi, I miss our kind of food in Mumbai. I am always game for a trip here just for the sake of food." As an actor, Shakti wants to enact many different characters and work in as many different languages, "I am Punjabi, my wife is half- Marathi, half-Bengali; I went to a Tamil school, it feels great that I can converse in so many languages. I would love to act in many more languages," says Shakti. Multi-talented Hollywood actor John Travolta, a dancer and singer par excellence, is so fond of Bollywood's song-dance that he matched steps with Priyanka Chopra on Tune Maari Entry without any prior preparation and wowed the audience at the 15th edition of the International Indian Film Academy (IIFA) Weekend. The four-day extravaganza ended here with the awards honouring the best work in Indian cinema and actress-singer Priyanka started the award ceremony with her performance and Travolta added zing to the act by joining her on the stage. After the performance, Priyanka praised Travolta's impromptu act saying: "Nobody could have done that without any rehearsal." At the gala, Travolta was honoured with the outstanding contribution to international cinema award. Hollywood actor-director-producer Kevin Spacey was the show stealer at the International Indian Film Academy (IIFA) Awards - he danced on the stage to Lungi Dance number with Bollywood diva Deepika Padukone. The occasion was the IIFA Awards night on Saturday when the show's hosts Farhan Akhtar and Shahid Kapoor requested Kevin to shake a leg to the Bollywood number. He happily obliged them. Wearing a lungi, the actor danced to the hit number from super hit Hindi movie Chennai Express with Deepika, who played the female lead in the romantic comedy. Farhan and Shahid also joined in. Hollywood actor Kevin Spacey dances the Lungi dance with the film's actress Deepika Padukone and Bollywood actor Shaid Kapoor. Prabhudheva had planned an elaborate holiday for himself and his two sons for their summer vacations. But it went all awry when his friend in Chennai lost their passports. "It was my friend in Chennai who not only lost my passport, but my sons' passports as well. I wanted to take them to Disneyland in Florida and other places after attending the IIFA (International Indian Film Academy) Weekend and Awards," Prabhudheva said. "Luckily I had not told my sons about the planned holiday. I wanted to give them a surprise. Had they known about the holiday in advance, they would have been very disappointed on it being cancelled," he said. The actor-choreographer-filmmaker now sees a larger plan in this aborted trip. I am not against open relationships, but they sound really nice and enjoyable till a certain age because at the end of the day what you need is peace of mind that comes from a committed relationship. Also, being in multiple relationships you end up damaging yourself more over a period of time. A real soul-mate or a partner who completes you as a person is something everybody looks for. A perfect open relationship is nirvana of the highest kind amongst humans, I think. But are we evolved enough to practice such an open relationship? I don't think so. It requires a mindset, social habit and a broad outlook. We Indians are not yet there to practice such an arrangement. The trend of open relationship makes no sense. If you are in a relationship it means commitment. Commitment means being faithful to each other and being faithful means being exclusive to each other. If you are not exclusive what is the meaning of a relationship? The idea of open relationship exists in big metros, but I am not in favour of it. The essence of any relationship is commitment. If you are not committed that means you are not in love with the other person. The concept of open relationship is only fit for movies. Open relationship concept exists, but I am surely not in favour of it. Commitment is important. Open relationship is of convenience. Either you are committed or you are not. The concept of open relationship is not practical. Open relationship means you are willing to be in a temporary relationship, which you can walk out anytime. Commitment is very important in a relationship. We live in India not America. I am open to the idea of an open relationship. There is less emotional baggage. People can live together and check out the possibility of being together forever. When two are not committed formally and live together, they come to know whether they can live happily or not. It saves you of the legalities. One is a free bird. Open relationship implies that a relationship exists on a level that is more than casual dating. However, in most cases these relationships do not work well in the longer term. Adults are free to choose, but this arrangement should be lasting. After movies, Vatsal Seth is now busy with his television show Ek Hasina Thi. The light-eyed boy, who has always played a good son in films, is glad to have got the chance to play a negative role in his show. He talks about it and more. I had not thought of doing a TV show, as I had two movies in hand. But when my friend, producer Sidharth Malhotra spoke to me about this show I agreed. They wanted an actor who didn't have the image of a bad boy. The graph and story was interesting, so I took it on. The show took a while to air. Was the wait tough? It was tough to wait, but everything happens for good. Due to the delay, we didn't shoot at a fast pace so we have good quality. Today, we have a good bank of episodes. Shourya has lots of layers. He has a nice, naughty and nasty side. He's such a two-faced guy that it amazing. He is different with his parents, girlfriend, friends and society. How is your chemistry with co-star Sanjeeda Shiekh? I had met Sanjeeda socially before working in this show. She is a fantastic actor and that's what you want in a co-star. Your Bollywood friends have shown lot of support for you. Though Dushasan is one of the most hated characters in Mahabharat, Nirbhay Wadhwa, who plays Dushasan in Siddharth Kumar Tewary's Mahabharat, has a huge fan following. Nirbhay shares, "I never thought that people would have a soft corner for Dushasan." ARIES: The need is to be vigilant as someone at office might try to harm your interest or reputation. Call friends you haven't seen for a long time. Drive carefully, especially two-wheelers. Tarot message: Well-wishers will give you sound advice. Lucky colour: Turquoise. Magic number: 60. TAURUS: Finances and investments will take up a major chunk of your time today. This is also a good time to deal with loans, debts and credits. This is a favorable time for speculation. Tarot message: Take limited risks. Lucky colour: Blue. Magic number: 52. GEMINI: Many of you will receive some sound counsel from unexpected sources, so pay attention to everything that you hear and take note of it. Tarot message: Health of elderly member at home will need looking after. Lucky colour: Rainbow-pastels. Magic number: 46. CANCER: This will be quite a surprising and rewarding day. Many of you will receive bonuses or pay hikes that were unexpected while others can receive appreciation for their hardwork. Tarot message: Leave thing open-ended if want best results. Lucky colour: White. Magic number: 39. LEO: The day will be busy yet happy; you will be able to achieve a lot in your personal as well as professional life. At work, your labour of the past few days will be appreciated and rewarded. Tarot message: Be creative. Lucky colour: Sea-green. Magic number: 28. VIRGO: A hectic social life will keep you on your toes today and lead to some new as well as interesting associations. A special someone will not have enough time for you. Tarot message: Wait a while; everything will get sorted out on its own. Lucky colour: Cream. Magic number: 63. LIBRA: Most of you will be craving for something stimulating and entertaining today. At work, too, you will be open to challenging assignments. Tarot message: You will get the help you need if you ask for it. Lucky colour: Red. Magic number: 41. SCORPIO: Manage personal relationships with diplomacy and thoughtfulness. This will be a day where you will need to think with your heart, especially as far as a special relationship is concerned. Tarot message: Do not overspend just to impress others. Lucky colour: Orange. Magic number: 32. CAPRICORN: If confused about relationships, don't hesitate to seek help and guidance. Those who are married will bring the spark back into their relationship. Tarot message: Stabilise your financial situation by making investments in property. Lucky colour: Peach. Magic number: 64. AQUARIUS: Travelling and communication will be a part of the day. Children will be filled with energy. Some of you will be philosophical and spiritually inclined. Tarot message: Avoid gossip session at the workplace. Lucky colour: Saffron. Magic number: 50. PISCES: Adventure, fun and entertainment will be on the top of your mind today. Conversation will be a highlight and you will surely get to hone your interpersonal skills. Tarot message: Involve yourself in a new project. Lucky colour: Purple. Magic number: 25. You will do very well during the year. High social status and good relationships are expected. October is great for business and tours. Your career will be much better than the last few years. If you earn through commissions, sales or business, you will be able to earn even more money from these areas. You will be financially stable all this year. Partnerships will be happy and harmony will reign. Compromise is the key and keeping the channels of communication open at all times. Married couples will face some troubles initially, but they will settle down later. Positive colours: White, Pink, Grey. Gems recommended: Pearl, Opal, White sapphire. Charity on birthday: Donate saffron-coloured edible items or a dress to the needy or at any religious place today. You share your birthday with Deepika Chikhalia (April 29,1965), who rose to fame playing Sita in Ramanand Sagar's hit television series Ramayan and was known for acting in other mythological TV serials. She became a Member of Parliament from Baroda in 1991 as a BJP candidate.